We are passionate about supporting individual leaders to become more ‘in sync’ – with themselves, their colleagues, their organisation, and the greater needs of society – such that they continue to progress in their career. Our work with individual leaders falls into two main categories. 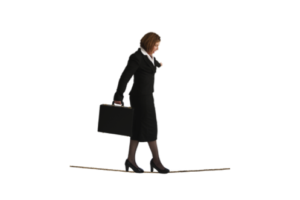 Our Walk the Tightrope sub-brand features our signature career development programme. The goal of this programme is to support individuals in their journey to power with integrity. In doing so, it leverages a proprietary set of tools based on years of executive coaching, and harnesses the collective intelligence of the group to provide additional support. The next advanced version of this course will be starting on September 21st. Click here to access the Walk the Tightrope web site, with further information. This sub-brand also includes primary research, thought pieces, a series of related workshops / talks, and the acclaimed Inspire Like a Man, Lead Like a Woman series. A subset of our coaching clients are seeking to initiate systemic change in their field. This is one of our niche specialties. We help these clients examine their potential “ripple effects” in order to maximise both the breadth, depth, and longevity of their impact. Through our work with these Changemakers, we have come to notice a cluster of common characteristics that tend to define this group. Using this knowledge we support them to be even more effective whilst also becoming more realistic in recognising their human limitations. Four business executives share insights from their experience working with CSL, including the impact the work has had on their careers.